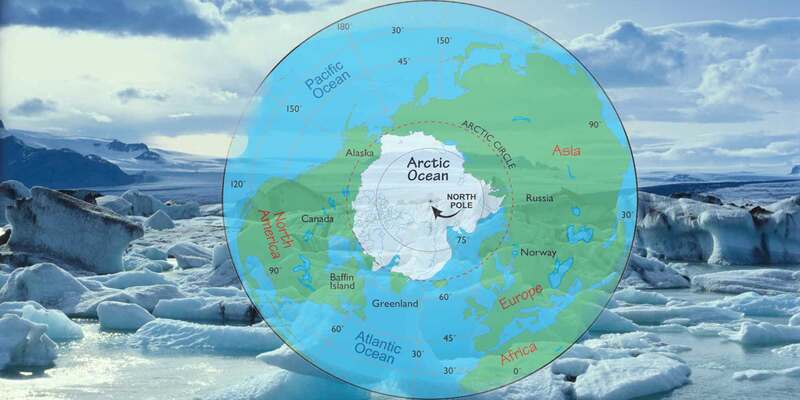 The regions of Earth surrounding its geographical poles (North Pole and South Pole) are known as Polar Regions. It is also known as Frigid Zone because these regions are dominated by Earth's polar ice caps, the northern resting on the Arctic Ocean and the southern on the continent of Antarctica. These regions are the zones in higher latitudes where there is never any summer in the sense that is understood in our moderate latitudes. Here, we are giving interesting facts about Polar Regions of Earth in general awareness. It is the northernmost part of the Earth and primarily made up of the frozen Arctic Ocean, that surrounds the North Pole. Landmasses of Arctic region include islands and the northern parts of the European, Asian, and North American continents. 1. The term 'Arctic' derives from Greek word ‘Arktikos’ which means near the Bear. 2. It is divided by the summer isotherm, a climatic boundary between regions with summer temperatures averaging 50°F (or 10°C)—the subarctic—and colder regions (the true Arctic). 3. Climate of this region is characterized by cold winters and cool summers. Winters characterized by continuous darkness, cold and stable weather conditions, and clear skies whereas summers characterized by continuous daylight, damp and foggy weather, and weak cyclones with rain or snow. 4. Vegetation: Plants such as dwarf shrubs, graminoids, herbs, lichens, and mosses, which all grow relatively close to the ground, forming tundra. Animals such as Arctic hare, lemming, muskox, caribou, snowy owl, Arctic fox, Grizzly bear, wolf, polar bear wolverines, ermines, and Arctic ground squirrels, seals, walrus, and several species of cetacean—baleen whales, narwhals, killer whales, and belugas. 5. There are over 40 different ethnics groups living in the Arctic region such as Saami in circumpolar areas of Finland, Sweden, Norway and Northwest Russia, Nenets, Khanty, Evenk and Chukchi in Russia, Aleut, Yupik and Inuit (Iñupiat) in Alaska, Inuit (Inuvialuit) in Canada and Inuit (Kalaallit) in Greenland. It is the fifth largest continent in the world and contains 90 percent of all of the ice on the planet. 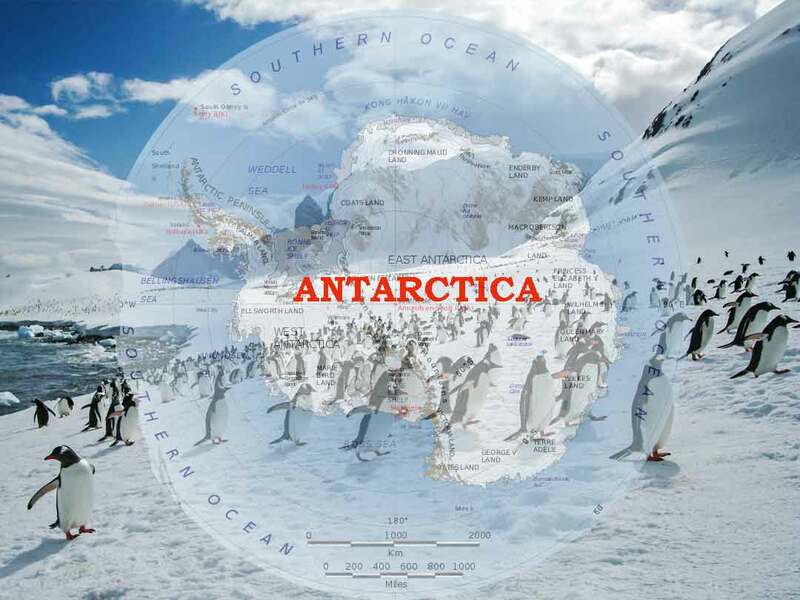 This continent is divided into two regions - East and West Antarctica. It is governed by the 1958 Antarctic Treaty, which establishes the continent as a peaceful and cooperative international research zone. 1. Scottish cartographer John George Bartholomew was the first who used the term “Antarctica” for the region and as a continent in the 1890s. 2. It is the highest continent with an average elevation above sea level of 2300 meter. 3. It is the coldest and the windiest continent. 4. 98 percent region is covered with ice and contains 70 percent of the world's fresh water. 5. Vinson Massif is the highest point with 4897 meter above sea level and Bentley Subglacial Trench is the lowest point with 2499 meter below sea level. 6. Penguin (flightless bird, but excellent swimmer) is the most famous inhabitant of this region. 7. Catherine Mikkelson (wife of a Norwegian whaling captain) was the first woman to visit Antarctica in 1935. 8. Emile Marco Palma was the first child born on the Antarctica in January 1979. Hence, we can say the Polar Regions are the most inhospitable places on the Earth. For centuries humankind has tried - and often failed - to reach and study both the Arctic and Antarctic Circles, losing life and limb in the process. Read more:What are Polar Regions? , North Pole , South Pole , Arctic Region , Antarctica Region , Polar regions of Earth , What plants live in the polar regions? , What is the polar ecosystem? , What is the polar climate? , What is the polar habitat? What is National Water Grid? What is the Ecological Profile of Andaman and Nicobar Islands? What is Western Disturbance and its impact on the Indian subcontinent? 2994 Views What is Money Laundering and how is it done? 2553 Views What are Grey List and Black List of the Financial Action Task Force?